Famous for its vast stretches of casurine fringed white sandy beaches, the coastal resorts of Malindi and Watamu are also world leaders in accessibility, beauty and diversity of marine life which lives just off-shore on Barracuda and North Reef coral reefs and Turtle and Whale Islands. 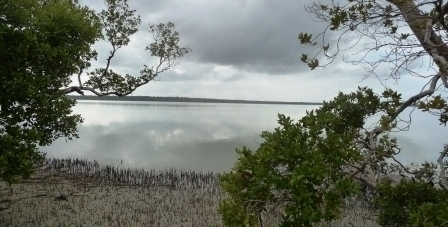 Watamu Marine National Park and Reserve engulfs the Mida Creek mangrove forest where young coral begins its existence before the tides take it out to the reefs beyond. The forests are rich in fish, crabs, prawns and oysters and are also excellent for birdwatching. Tewa Caves, near the mouth of the creek, are partly underwater - here Giant Groupers (up to 800lbs) live with many other exotic fish species. On land Giant Monitor Lizards, dik dik, mongoose and monkeys. The coral reefs are home to more than 140 species of hard and soft corals. Their symbiotic relationship with the chlorophyll generating animals give the corals their spectacular night-time phosphorescent colors. The reef plays a diverse role. As well as bio-diversity strongholds, they are breeding grounds for fish and other marine life, a vital barrier against the force of the sea, protecting marine organisms and tourist recreation, they keep out dangerous sharks common to the deeper waters, and their color and the exotic coral fish they support provides a major attraction for tourists. Historic Gede Ruins and Lamu Islands offer exciting day trips. Note: Discover Mida Creek with me!